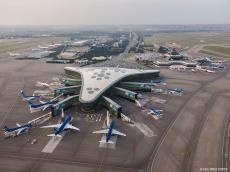 Heydar Aliyev International Airport, located in Baku, Azerbaijan, is among 14 most beautiful airports in the world, according to the rating made by Curbed, an American real-estate blog network. “Located in the capital of Azerbaijan, the Heydar Aliyev International Airport terminal features giant wooden cocoons designed by Turkish architecture studio Autoban,” said Curbed. Other airports included in the rating are: Denver International Airport, Madrid Barajas International Airport, Kansai International Airport, Beijing Capital International Airport, Chhatrapati Shivaji International Airport, Kuala Lumpur International Airport, Marrakech Menara Airport, Kutaisi International Airport, Shenzhen Bao'an International Airport, Pulkovo Airport, Queen Alia International Airport, Changi Airport and Samui Airport.